Creating new Active Directory user is one of the regular task for every Administrator either for testing or for actual new employee. For that case you can create new AD user using ADUC console. But some of us feel it is time consuming job. To overcome this I have planned to write Powershell Script to Create new AD User. You can see different powershell script samples to create AD user in following examples. 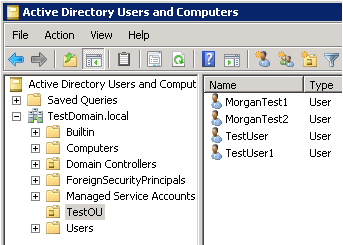 You can use the Active Directory module’s cmdlet New-ADUser to create new AD user. Before start, ensure that the Active Directory module for Windows Powershell is installed or not by using following command. It will be installed by default in Domain Controller. In client machines, you need to install it through Remote Server Administration Tools. 1. Copy the below Powershell script and paste in Notepad file. 1. Consider the CSV file NewUsers.csv which contains set of new ad users to create with the attributes Name, samAccountName and ParentOU. Note: The value of ParentOU should be enclosed with double quote ("). like "OU=TestOU,DC=TestDomain,DC=Local" since it has the special character comma (,). because in csv file the comma (,) is the key character to split column headers. (Ex file: Download NewUsers.csv). 3. Change the NewUsers.csv file path with your own csv file path. $userPrincinpal = $_. "samAccountName" + "@TestDomain.Local"
6. Now run the Create-BulkADUsers-CSV.ps1 file in Powershell to create Bulk Active Directory users from CSV file. 7. Now you can check the newly created AD users though ADUC console. 5. 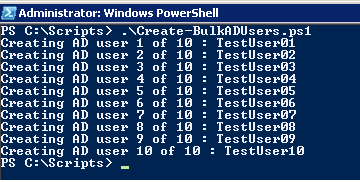 Now run the Create-BulkADUsers.ps1 file in Powershell to create Multiple Active Directory users for Testing.